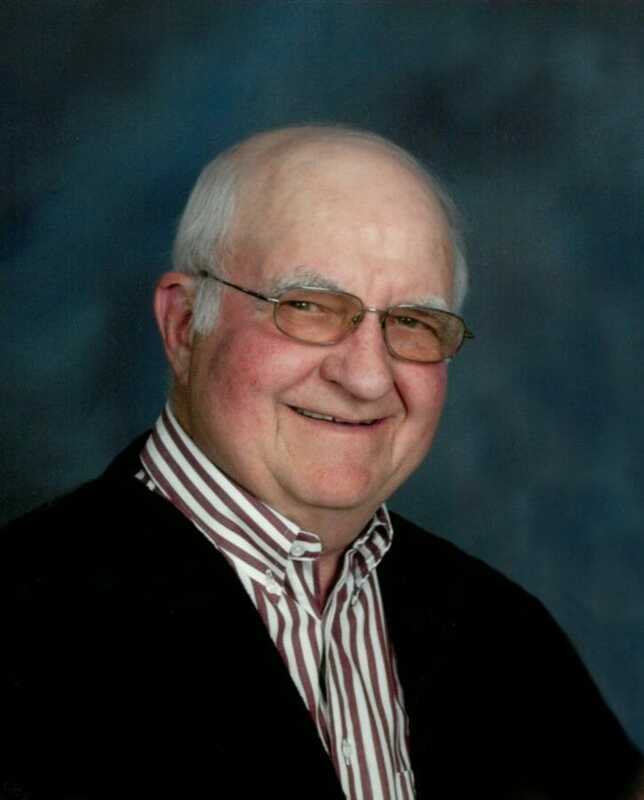 Edwin Huss, age 85, St. Joseph, MN, formerly of Sykeston, ND, passed away peacefully surrounded by his family, on the evening of February 4, 2019. Edwin was born August 1, 1933 to Michael Huss and Elizabeth (Hafner) Huss on their farm in Sykeston. He grew up on the family farm until graduating from Sykeston High School in 1951. He was united in marriage to his high school sweetheart, Lou Ann Wild, on September 27, 1954 at St. Elizabeth’s Catholic Church in Sykeston. They were blessed with four children and filled their home with faith, love, and laughter. Edwin drove the Standard Oil bulk delivery truck until he enlisted in the U.S. Navy in May of 1952. He was proud to serve at the Headquarters of the 8th Naval District in New Orleans and the Naval Command in Washington, DC. After his honorable discharge in 1956, he attended 1 year at Wahpeton State School of Science. Edwin was honored to serve the community of Sykeston as rural mail carrier for 25 years, and then as Postmaster for another 14 years. He was known to drive 95 miles a day, 6 days a week, in all kinds of weather without an accident or missed delivery. After his day on the job, he would often continue working – he was known to be a skilled carpenter and painter, as well as a laborer at Lundby Elevator. Edwin was a generous soul and served in a variety of ways. He was a member of St. Elizabeth’s Catholic Church serving as a Parish Council member, Sexton of the Cemetery, Lector and CCD teacher. He was active in city government serving on the city council and park board. He served on the Wells county Planning Board and was a member of the Americans with Disabilities Act Advisory Board. Edwin was a member of the Sykeston Fire Dept, life member of ND Firemen’s Assoc, FOE Eagles, Knights of Columbus, St. Joseph Society, Sykeston American Legion where he was a member for 62 years (39.5 years serving as adjutant). Edwin was an avid sports fan! His favorite activities were coaching grade school basketball, Pee Wee and Babe Ruth baseball. He also enjoyed playing cards and dancing. He greeted everyone with a smile and a story or joke. May his kindness and compassion live on through all of us. He is survived by his wife of 64 years, Lou Ann; children, Gail (Brad) Morlock of Lewiston, ID; Vicki Carlson of St. Joseph, MN; Amy (Mike) Miller of Fort Gibson, OK; and Kent (Sarah) Huss of Minot, ND; eleven grandchildren and ten great-grandchildren; siblings, Catherine Kutz, Robert (Barbara) Huss, Sally Wescom, Pauline (Babe) Risberg; sisters-in-law, Carol Wild, Jean (Pat) White; many nieces and nephews. He is preceded in death by his parents; father and mother-in-law, Alphonse and Mary Wild; son-in-law, Gregg Carlson; siblings, Ann Marie (Orvell) Lundby, Bernie (Grace) Huss, Raymond Huss, Leo (Mary Jane) Huss; brothers-in-law, Clinton Kutz, Mick Wescom, Jack Wild, Doug Wild; nephew, Mark Huss; niece, Brenda (Kutz) Hewitt. Visitation will be held Tuesday, February 19, 2019, from 9:00AM to 5:00PM in Evans Funeral Home, Carrington and 6:00-7:00PM with a Rosary at 6:45PM followed by a Prayer Service at 7:00PM all in St. Elizabeth’s Catholic Church, Sykeston, ND. Funeral Service will be held Wednesday, February 20, 2019, at 10:30AM in St. Elizabeth’s Catholic Church, Sykeston, ND. Burial will be held at the St. Elizabeth’s Catholic Cemetery, Sykeston, ND at a later date. So sorry for your families loss. He will be truly missed. You are in our prayers. So sorry to hear this. I so much enjoyed conversations with Edwin. The Sykeston community lost a good one. Janine and I are very sorry for your loss. Edwin was an iconic Sykeston citizen. We always looked forward to greeting him everyday as he delivered the mail. His dedication to the church, the town, his job, to his fellow Sykestonites and to his family will long be fondly remembered. Edwin was our hero, historian, best friend, encouragement, beautify the park and streets —he was Sykeston’s everything. I wish much encouragement and strength to his family, sympathy and goodness. We will miss you forever. Sorry to hear of Edwin’s passing. He always had a smile and kind words to share. When I think of visiting my grandparents in Sykeston, he always comes to mind. He was a very wonderful guy! Thoughts and prayers to your family! Edwin will always be remembered by us with a smile. A very special man whose presence will be missed. Our condolences to LouAnn and all the family. All of you are in our prayers. I grew up with Edwin starting from almost the day I was born; through St. Elizabeth’s school and then through Sykeston High School. He was really fun to be around but also a very kind and compassionate person–I won’t forget him. He was also funny with maybe a little bit of being ornery (takes one to know one) and I’m sure Father Sommerfeld will greet him at the gate with a smile–or maybe with a “psst,Eddie”!! We spent a lot of time playing together both in grade school and high school and he was an important cog in our run to the ND State Basketball tournament and also at the tournament in Valley City where we got 3rd place (with 9 boys in high school). So sorry for your loss. My thoughts and prayers are with you. May you find comfort in all the memories of time spent together. We are sending our prayers to you Louann and families he was a soft and gentle but loved to laugh had so much fun last time we visited, much sympathy to all love Merle and Sheila and family. Steve & I are so sorry to hear of your Dad’s passing, Kent. All of these comments are such a fine tribute to a great guy! Edwin jus t had a way of making everyone around him feel good. Condolences to a fine family. He will be missed by the entire community. So sorry for your loss. It was always great to run into him with his smile and friendly ways. Our prayers and good thoughts are with you. To the family of Edwin Huss: Our thoughts and prayers are with all of you. Was glad to see and talk to both of you this summer. Take care. So very sorry to hear of Edwin’s passing. Have many fond memories of Edwin also. As a mail carrier we could set our clocks by him as he delivered our mail at 11:20 every day rain, snow, or shine on our farm. Later as the Postmaster I would go in and visit with him sometimes in the post office in the afternoons. I always wondered how he could be inside all day like that and it must have bothered him especially on nice days but he never complained and always had a smile on his face! Edwin was a good man, friend, Dad, & helper in the community. When God made him he broke the mold and you can never replace a man like that. Great guy and we will all surely miss him. He was so very proud of his family and spoke highly of each one of them too. Played many a card games with him and Lou Ann and we enjoyed our visits with them too and they are deeply missed believe me! May our dear Lord grant you all peace in your time of sorrow. You all are in my thoughts and prayers. Every time I saw Edwin he would bring a smile to my face. God broke the mold with him. He had a long life and that is something to be so grateful for because without a doubt he brought joy to so many people during his time here. Love to all of you. I am saddened to hear of Edwin’s passing, but take comfort in knowing he led a life of kindness and devotion, was a role model in the community, and was a wonderful spouse and father. His memory will be a blessing to everyone who knew him. Sending thoughts of peace and comfort to the Huss family. Edwin was one of the first people I met when I moved to Sykeston as a young, first year teacher. His genuine warmth was very welcoming as I set up my first official mail box. Edwin never missed a basketball game and always arrived early enough to get his favorite spot in the bleachers….mid-court. Dale and I will forever have fond memories of our time in Sykeston in large part due to people like Edwin and the legacy they built. We feel blessed to have known such an honorable man and fortunate that we got to visit with him at the reunion this past summer. Our deepest sympathy to LouAnn, Kent, Sarah, and family. I was so sad to hear of Edwin passing . The two of you were a couple as long as I can remember. I will always remember the two of you dancing the jitterbug at one of the school reunions , a class act . I also remember Edwin of being respectful of everyone. My sympathy to you and your family.